Fall Flowers are Fabulous at Brant Florist as we Celebrate 50 Years in Business! Fall flowers feature beautiful fall colors and will make their day! Welcome to the first issue of Brant Florist’s fun and info packed blog. Our blog will always highlight fresh flower news, new product introductions, flower care tips, lifestyle trends and helpful hints as they relate to, of course, flowers! So get comfortable, take in autumn’s rich outdoor hues and allow us to first thank you, our loyal customers, for supporting Brant Florist through 50 fabulous years of business! Yes, it’s our 50th anniversary! We are honored by your continued confidence in knowing that excellent service and beautiful product come standard with every order at Brant Florist. Again this year we have achieved top FTD worldwide florist status but we are most proud of the fact that we are at the top your list every time you need fresh flowers, fast. You can count on us to provide same day service across Canada and the USA and next day service delivery internationally through FTD, Teleflora and Interflora worldwide partners. No matter whether you are sending flowers to your sweetheart across town or your aunt half way across the world, rest assured that Brant Florist ensures fresh, hand-designed and hand-delivered flowers will get there in time. We feel privileged to be your go-to, real florist shop every time you need spectacular anniversary and birthday flowers or when you’re looking for beautiful custom designed flowers for that someone special, for no reason at all! Locally, we encourage you to visit our retail flower shop at the corner of Brant and Maria streets in Burlington, Ontario, Canada. Come see our coolers full of fresh, stunning flowers. If you are running short on time, (who isn’t these days! ), breathe easy knowing that you can order from us 24/7 in the convenience of your own home at www.brantflorist.com. Certainly the technology we use to help serve you has changed over the years. It was 2004 when we first redesigned our original website, (we are continuously improving our site to better serve you), yet our personal touch will never go out of style. We have always been a family run business and even today you will find either Ken Bolt or sons Doyle and Tim answering phones and processing orders on just about any day of the week. For fall and winter 2011 we are excited to introduce new products from FTD and Teleflora to our website. This means you have hundreds of new flower selections to choose from for fall, Thanksgiving and Christmas. As a hostess gift, why not send flowers in advance of your arrival to a fall dinner party. Your host will be thrilled by your thoughtfulness and the flowers will encourage lots of conversation over dinner. 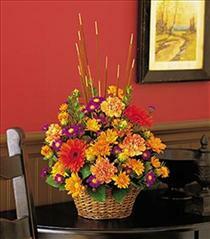 May we suggest our Teleflora’s Sunrise Sunset arrangement? This new fall flower arrangement is awash in fiery orange roses, lilies, spray roses, gerberas and red carnations. It’s sure to spice up any gathering! If you are hosting your own Halloween bash don’t forget to spook up a little fun with boo-ti-ful flowers. Our new Fall Grandeur Halloween arrangement features lilies, roses and greens. It is spectacular, you should check out the image on our website. Whether you need a fall flower centerpiece to make your dinning room table come alive, (order Thanksgiving flowers soon, U.S. Thanksgiving is on Thursday, November 24th this year), need help planning funeral flowers of a loved one, or are planning a winter wedding date, our Brant Florist team is ready to serve you. 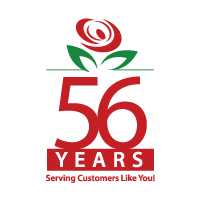 With 50 years of experience under our belts we execute each flower order with the highest level of professionalism. Excellent customer service and beautiful, quality product are what our customers receive with every flower bouquet, arrangement, gourmet fruit basket and plant order. Thank you for a beautiful and flowery 50 years! Big Thanks Brant Florist for bringing us pretty flowers year after year. You never seize to amaze with the great service and excellent selections of all kinds of floral gifts. Congrats on the 50th anniversary. Congratulations on your 50th anniversary, as always you never fail to shock and awe me with the beauty of your floral arrangements. My parents are having a 50th anniversary this year as well so I will be looking for a flower arrangement for that as soon as I can find out what flowers they had at their wedding and what colors. I have bookmarked your web site so I can order them as soon as I find out. Thank you for the ideas through out the years when I was short on time and needed a gift for someone. I hope you have another 50 years of success. You have some of the most beautiful flower arrangements I have ever seen, it is no wonder you have been in business for fifty years and you are still going strong. I hope you have many more years of success. I know that this is not on the subject but I have been watching over the years the changes you have made to your web site and I think you have done a great job. Are you making these updates yourself or have you hired a company to write the content and post the pictures for you? Again congratulations and best wishes on many more. Congratulations, that is fantastic. 50 years of business takes a lot of endurance and a commitment to great customer service. Well done! Here’s to another fifty years of business. I love fall, the colors the temperatures the rain it is always so beautiful and I can’t forget the smells and the flavors of the Harvest spice coffee and the pumpkin pie. Your flower arrangements really bring out the colors of fall and the arrangement with the ceramic pumpkin is so cute, do you have a way of putting a pumpkin smelling candle in that arrangement? This is the first year I won’t be home for Thanksgiving and I think they would really enjoy that arrangement. Your new blog looks great and I look forward to seeing your new flower arrangements when ever you post them.